Ang Temba called the BAI office today and reported that the trekkers reached Pangboche today after visiting several villages along the way. These past few days they visited monasteries in Thame and Tangboche and having a great time. The weather has changed slightly, sunny in the mornings and cloudy in the afternoons but it did not stop our trekkers from getting a glimpse of the big peaks today in Pangboche. They were thrilled to see Ama Dablam and Everest, knowing that they soon will be at the base of Everest. Hopefully tomorrow morning they will be treated to the beautiful sunrise over Ama Dablam. Catharine was able to speak with her daughter Kit by radio the other day which was great. Kit was on Everest at Camp 2 when Catharine connected with her so it was exciting for them to connect. Tomorrow the team will make their way to Pheriche where they will spend 2 nights to help with their acclimatization. 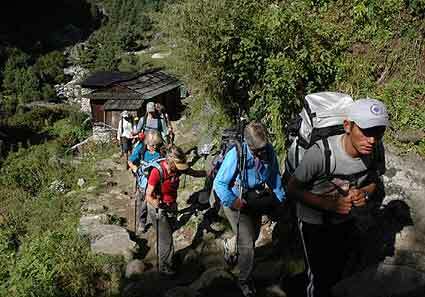 We will keep you updated as they progress towards Everest Base Camp.